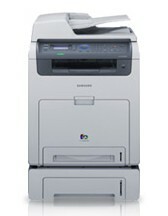 Samsung renew their range of multifunction color devices by replacing two models (CLX-6210 and SCX-6240). The new CLX-6220FX and CLX-6250FX respectively print at 20 and 24 ppm in Black and Color. In terms of innovation, with regards to the old range, the manufacturer emphasizes the use of two specific technologies: Instant Fusing (FIs) that accelerates the melting of the toner and thereby reduces the preheating time and the FineEdge technology that refines text. Both stations get increased memory and processor power compared to earlier versions.